National Park Kurshskaya Коsа, in Zelenogradsky District of Kaliningradskaya Region, was established in 1987 on the basis of a landscape zakaznik. Its area is 6,6 thousand ha. 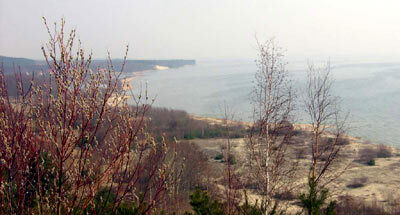 The Park includes the southern part of the spit, separating the Kurshsky Bay from the Baltic Sea. The relief is the result of the activity of sea waves and wind, the seashore being exposed to intensive water erosion. In the cross-section three following zones are distinguished: sea beach (10-40 m) with a protective rampart (50-150 m), a man-made structure to strengthen the dunes; pre-dune plains; dune ridge. 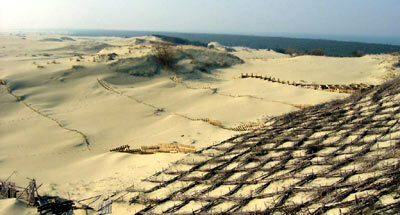 The ridge width is 300-500 m; mean height, 20-40 m. There occur dunes up to 60 m high, the highest in Europe. Valleys and dune ridge are forested and fixed with plants. Forest has been planted since the middle of the 19-th century, and all the forests available have been planted. Old-age stands do not differ greatly from natural. 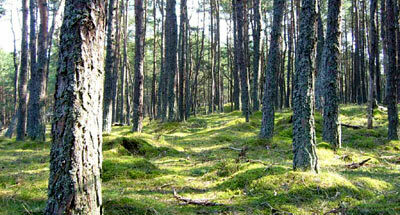 Pine forests predominate, and there are spruce-pine, pine-birch forests. In the neighborhood of the town Rybachy there are plots of broad-leaved hornbeam-lime forests. On traveling dunes, plant communities of different levels of overgrowth are to be found. The Park is situated on the main flyway of migratory birds, and their high density during the migration period is characteristic. About half of the birds of the local fauna (total number is 233 species) have nesting grounds in the Park. Among the mammalian dwellers are the moose, roe deer, wild boar. The predators include the marten, ermine, least weasel, otter, badger, raccoon dog. The European hare, squirrel, muskrat and beaver are common.